I lead Children’s Ministry at my small church. 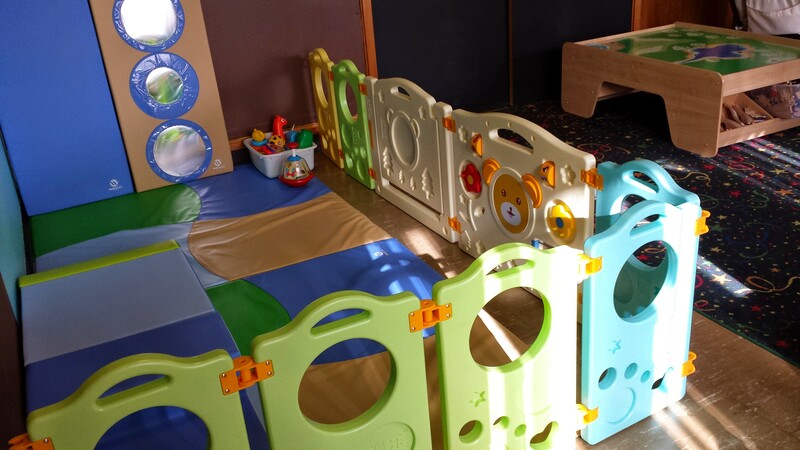 Our youngest children are in a large classroom; they range in age from birth to Pre-Kindergarten. It was impossible for our workers to find a safe spot for newly mobile infants. Thanks to a donation, I was given a budget of $900 to create a Crawler Zone. When I started looking into the project, I was overwhelmed by the choices that are available. First of all, I had a hard time finding the products I’ve seen in crawler zones at libraries and children’s museums. I didn’t know what they were called. My advice to you is, do a Web search for “soft play toddler.” You can go to the company websites and request catalogs if that’s your preferred method of browsing. Wesco brand products will come up quite frequently. I ended up selecting Wesco floor mats, wall mats, and “tiny tot module” (the climber/slide) that were in keeping with the colors in our classroom. Second, I wanted wall-mounted educational toys. Upon further investigation I discovered that they are (a) super expensive (like, $300+) and, (b) not necessarily age appropriate for crawlers and toddlers. I bought some inexpensive Fisher-Price toys for 6-18 months that I placed in a bin on the floor, but was still determined to find something wall-mounted that babies can manipulate. Third, we needed some sort of gate. I looked for long baby gates that didn’t need to be fixed to the floor (because we have 60-year-old tile floors that are indestructible). That type of gate is hard to find. When I did find it, I also discovered it was pricey and got poor customer reviews. My second and third dilemmas were solved together. I found the KiddyGem playpen that has toys mounted on it. It makes a pleasant “squeezey toy” squeak when the bear’s ears are pressed. No batteries are required. There are suction cups on the bottom of each playpen piece. Since we have the aforementioned indestructible tile floor, I used a spray bottle to squirt water under each suction cup and was pleased by the squishy sound I heard when I pressed down on the suction cups. 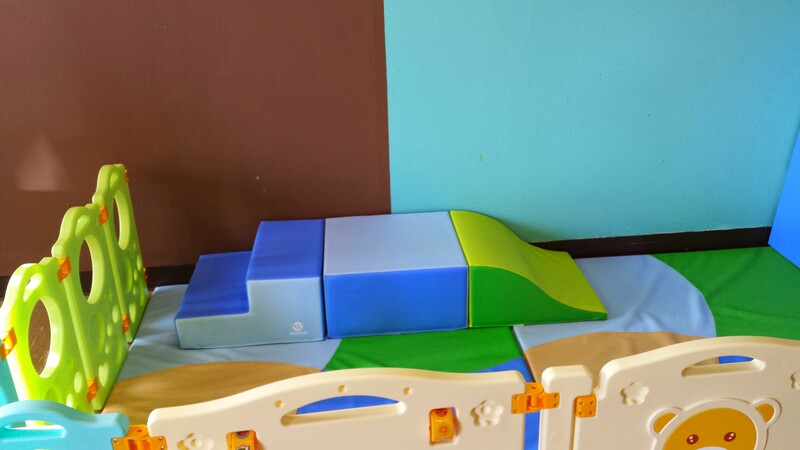 KiddyGem makes this playpen in a variety of colors and themes. The interlocking pieces create about 12′ of perimeter that you can put in a configuration suits your needs. Fourth was the issue of shipping costs. You can’t just walk into Target and buy Wesco products. I ended up ordering everything through Amazon, rather than from the manufacturers. The prices were sometimes identical, sometimes lower, and were always competitive. As an Amazon Prime member, I actually got some items shipped for free. My recommendation is to total up your shipping charges and decide whether it might be cheaper to just buy a Prime membership. (And you’d get all of the other benefits of Amazon Prime, too!) WalMart does sell a few Wesco products on their website. So another option is to order those and have them delivered to the store. You would pick up your items at the store for free. Finally, I wanted a sign that clearly marked the area as a spot for babies and toddlers. I had visions of the tweens coming in and smooshing the soft furniture pieces, leaving their awkwardly big footprints all over the areas where babies crawl. 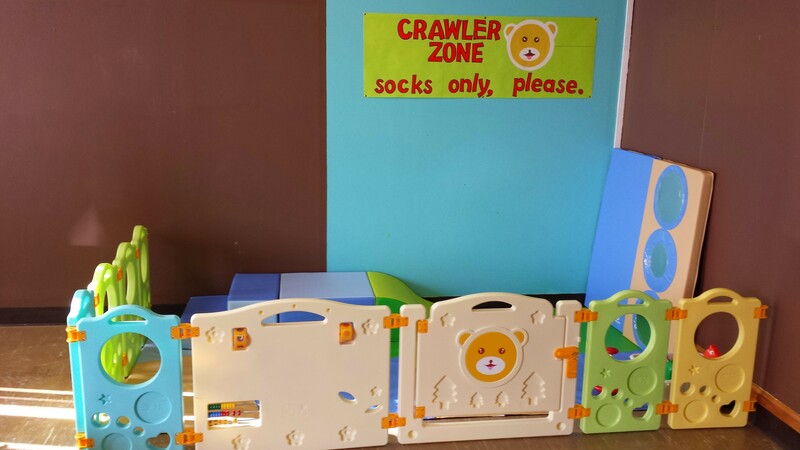 My budget was already spent, so I taped together six 11×17 pieces of paper, turned them over, and placed bulletin board lettering reading “CRAWLER ZONE: socks only, please.” To tie it all together, I copied the artwork from the baby gate and put it on the sign also. Then, I covered it with a long piece of clear Contact paper paper and tacked it to the wall. I will try to come back and post an update in a few months to let you know how durable and practical we are finding our space to be. I hope these tips save you some time and sanity when designing your own crawler zone on a tight budget. Here are some updates to our children’s department. We are overjoyed with God’s many blessings. Previous Previous post: How I Met Your Mother: Sitcom or Mystery?